Welcome to Philly. Enjoy the hurricane. PHILADELPHIA-After a summer full of home improvements, getting kids into college and just getting through, work, life and bills, the missus and I busted out of the battleground state of O-H-I-O for a long weekend in the City of Brotherly Love and Cheesesteaks. I must like Philly. I’ve probably been here a dozen times, but this was the first time I’ve done some of the usual tourist things. We visited the Philadelphia Art Museum, ate a few times at the Reading Market Terminal and tonight we’re going out for dinner at a jazz club. The only bad thing so far is our timing. We picked the same weekend Hurricane Sandy is supposed to hit Philly. Whether it will still be a bona fide hurricane or downgraded to a tropical storm who can say with complete certainty? I suppose we could hang around to find out, but that’s an experience we’ll just save for another day. Traveling from the hotly contested state of Ohio through Pennsylvania coal country is an experience that makes you raise an eyebrow. I don’t know what President Obama’s policies on coal usage have been, but they aren’t popular in this part of the state. There were plenty of anti-Obama signs and billboards dotting the landscape. The expectation must be Mitt Romney would be more accomodating to the coal industry. The polls give Obama has a six-point lead over his Republican challenger but that Romney has shaved two points off of the president’s lead with nine days to go. Before we entered the Philadelphia Art Museum, we spent nearly an hour talking with a nice woman in a faded Obama “Hope” pullover who spotted my own “Obama/Biden” button and started smiling and talking with us excitedly. We agreed the election will be close and turnout will be key to the president’s hope for a second term. We also expressed mild disbelief anyone could still be decided this late in the game. It’s nice to run into a kindred spirit who is every bit as apprehensive of what Romney and Ryan would do to this country over the next four years. Taking in all the city has to offer would take far time than we have. 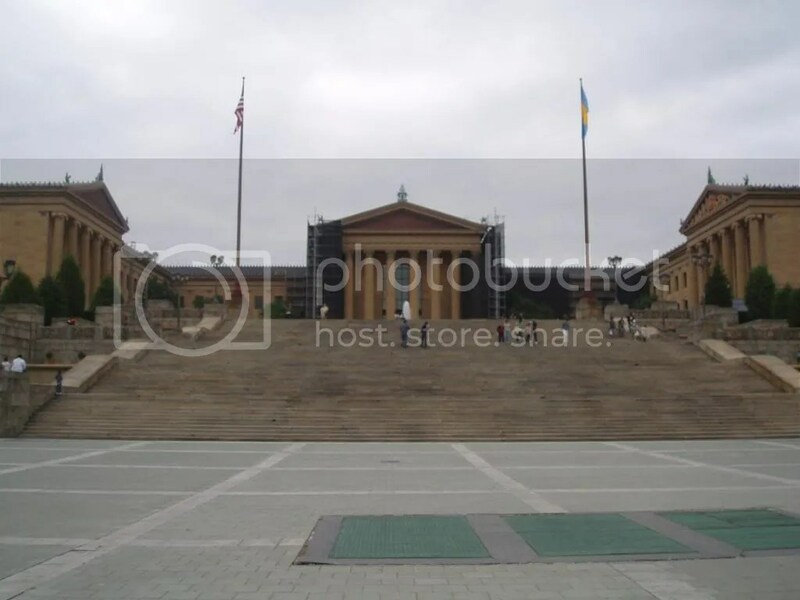 A ticket to the Philadelphia Art Museum is good for two days and includes a shuttle to three other galleries. You could spend the entire trip immersed in art if that’s all you wanted to do. You aren’t exactly lacking for choices in cuisine either. Unfortunately, there’s a minor matter of Hurricane Sandy barreling down the Eastern seaboard, so we’ve got to get back on the road and out of town before it gets here. No time for cheesesteaks this time.